Nodes and hubs alongside major traffic corridors – where traffic comes to halt and exchange between actors en route happens – represent new forms of urbanity and public space where both individual’s routes, routines and rituals, political transitions and urban transformations can be explored. When increasing numbers of people are obliged to spend increasing amounts of time in transit then transition nodes, hubs and terminals along their primary route – where exchange between the actors en route happens – acquire ever-greater significance. If we follow Henry Lefebvre’s thesis that urbanity is no more defined by density but by the degree of difference performed at specific places then these nodes paradigmatically represent new forms of urbanity and public space. What remained largely unexplored in their investigation so far was emphasising at these nodes as polyrhythmic ensembles, linked to their temporal adaptability – reacting on daily, weekly and seasonal rhythms of traffic flows – as well as their interdependence of one another. This webpage presents the theoretical framework and the methods developed during preceding art based research projects by Michael Hieslmair and Michael Zinganel emphasizing on nodes of mobility and migration. Moreover the webpage documents the concept and proceeding of the current project comparing three nodes arranged in a triangle Vienna (AT) – Russe (BG) – Tallinn (EST). 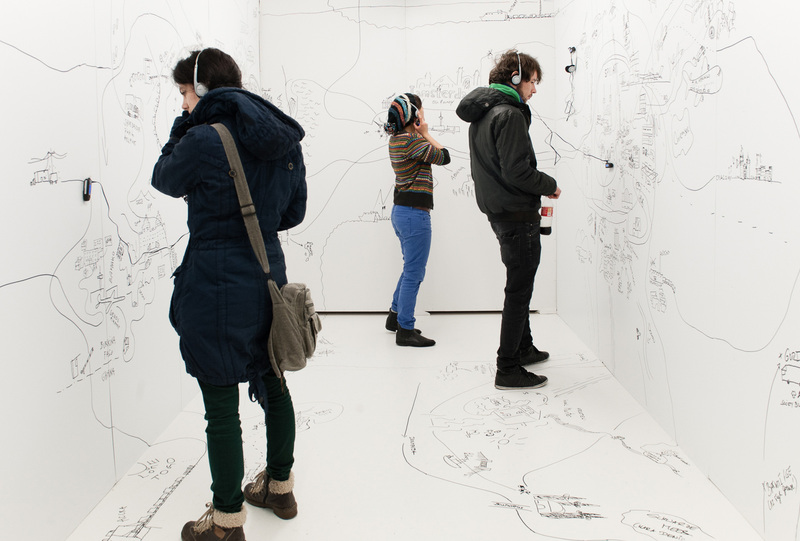 Using a transporter van, that also serves as a mobile laboratory storing artistic artefacts, comics, and maps, each of which representations of preliminary research that serve as a trigger for episodic in-situ interviews the reaearch team will generate forms of knowledge that will later be transformed into large scale art installations on site (and in art institutions nearby). The goal of the project will be to develop a networked “cartography” of hubs and routes that displays both supranational developments and individual experiences of mobile actors as well as the impact of both on urban transformations. Stop and Go – Nodes of Transformation and Transition is a research project at the Academy of Fine Arts Vienna, Institute for Art Theory and Cultural Studies funded by Public Spaces in Transition – Call 2013 within the framework of the funding program ‚Social Sciences and Humanities in Vienna‘ of WWTF Vienna Science and Technology Fund.